Our students and faculty, as you, feel the need to help contribute to the solution of the pressing problems of society. Energy, materials, food, housing, transportation, health care delivery, and employment opportunities, all fall far short of meeting the world’s needs…Engineers must create technologies with accompanying social benefits at acceptable economic and social costs. To do less is to fail as an engineer. This is why so much of what you see reflects our very extensive engineering research activity. 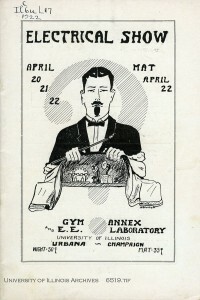 Program from the 1922 Electrical Show. Found in Record Series 11/6/805. Friday, March 8th marks the beginning of the 93rd Engineering Open House, the largest annual student-run event of its kind to promote scientific and technological innovations in engineering through exhibits, contests, and demonstrations. As it was in the 1970s, the Engineering Open House is global and futuristic in scope, cognizant of the social responsibility of engineers and the impact of their scientific and technological advancements. 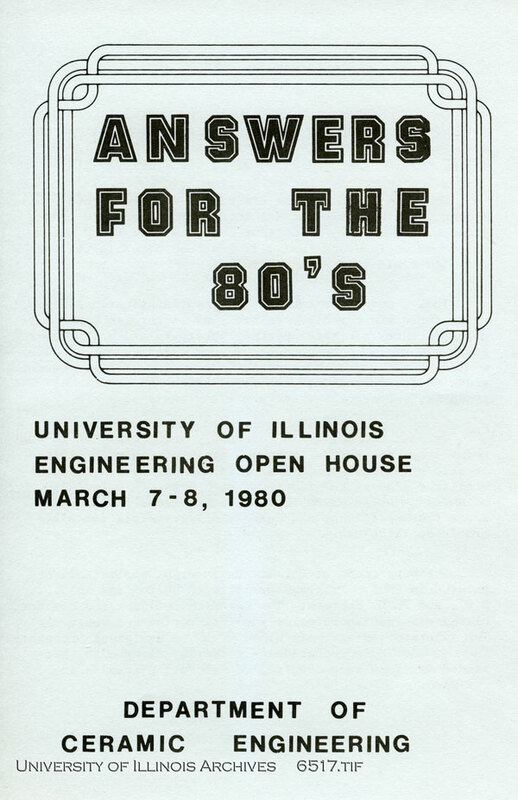 Although the Engineering Open House was officially established in 1920, it has roots in the Department of Physics Open House and Department of Electrical Engineering Electrical Show in 1906 and 1907, respectively. The latter, while a modest affair at first, attracted increasingly larger crowds each year with such demonstrations as the melting of glass with electricity, the conversion of light into electricity using Professor Jacob Kunz’s photoelectric cell, and even an electric fortune teller. Although the intent of the Electrical Show was to chiefly demonstrate new technologies and ideas, the Engineering Open House was initially more educational in nature. The first Open House in 1920 coincided with a commemoration of James Watt and his “influence upon the industrial development of the world.” It exhibited the College’s laboratories and facilities, including a Mining and Railway Museum located between the Mining Laboratory and the Transportation Building. 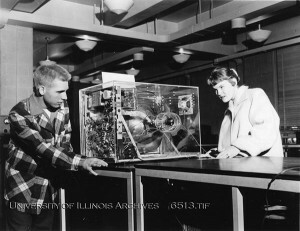 During the 1930s and 1940s, the College also hosted annual Illinois Student Engineering Exhibits which served a similar function to the Open House. Following World War II, the Electrical Show and its demonstrations were subsumed by the Open House, and the affair eventually evolved into an event with the intent of showcasing the accomplishments of departments as well as student innovations in research through both exhibits and demonstrations. Program from the 1972 Engineering Open House. Found in Record Series 11/1/805. Ceramic Engineering Open House program, 1980. Found in Record Series 11/4/803. 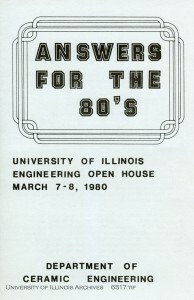 Though some of the original goals of the Engineering Open House are still included in its programs, such as educating the public and highlighting the accomplishments of the College, archival materials demonstrate the development of the Open House and the College becoming more aware of its role in the larger cultural and social milieu, which in turn has influenced its goals, demonstrations, and exhibits. Dean Drucker underscored this idea well: “we try to convey to our visitors the important role of technology in our daily lives and how our future depends critically on the contributions of well-educated engineers.” The University Archives’ collection of programs, photos, newspaper clippings, and posters document the perspectives of students, faculty, alumni, and the public as they visited the Open House and learned more about the importance of the role of science and technology in society. As more archival documents and electronic files are transferred to the University Archives, the more complete our understanding of this, and other events in the College of Engineering’s history will become. 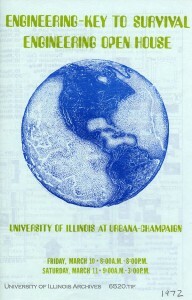 Engineering Open House Program newspaper, March 1975, Record Series 11/1/805, University of Illinois Archives. Engineering Open House Program newspaper, March 1976, Record Series 11/1/805, University of Illinois Archives. “Our Mission,” Engineering Open House, accessed March 4, 2013, http://eoh.ec.illinois.edu/. 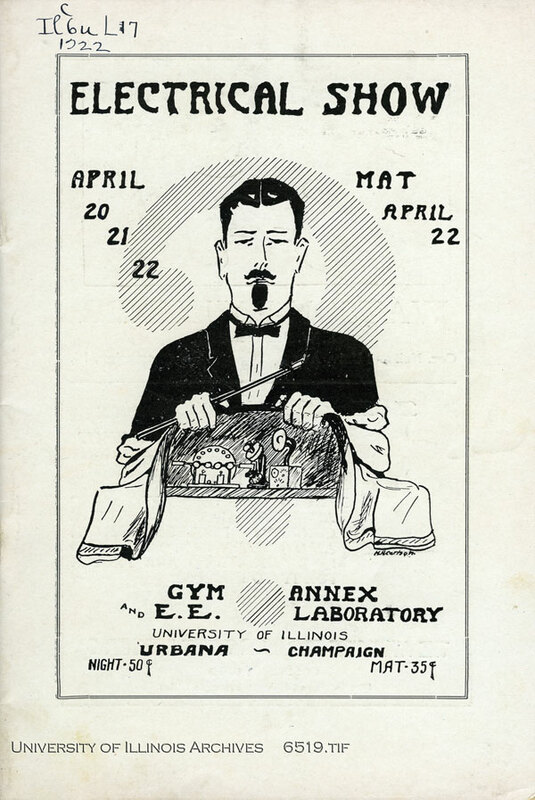 Electrical Show program, April 1920, Electrical Show, Open House Programs, Record Series 11/6/805, University of Illinois Archives. Ira O. Baker and Everett E. King, A History of the College of Engineering of the University of Illinois, 1868-1945 (Urbana: University of Illinois Libraries, 1947), 902. Watt Centenary and the College of Engineering Open House program, March 23, 1920, Record Series 11/1/805, University of Illinois Archives. “Engineering – Key to Survival” Engineering Open House poster, March 1972, Record Series 11/1/805, University of Illinois Archives. “Engineering – Key to Survival” Engineering Open House program, March 1972, RS 11/1/805, University Archives.